Vim comes with a set of often outdated and counter-intuitive defaults. Vim has been around for around 30 years, and it only makes sense that many defaults did not age well. The defaults above enable some of the nicer editor features, like autoindent (respecting existing indentation), incsearch (search as you type), or wildmenu (enhanced command-line completion). The defaults also smooth out some historical artifacts, like unintuitive backspace behavior. Keep in mind, this breaks compatibility with some older Vim versions (but it’s unlikely to be a problem for most if not all users). If you’re using a custom color scheme (why wouldn’t you?) in conjunction with a terminal mode in Vim (again, why wouldn’t you? 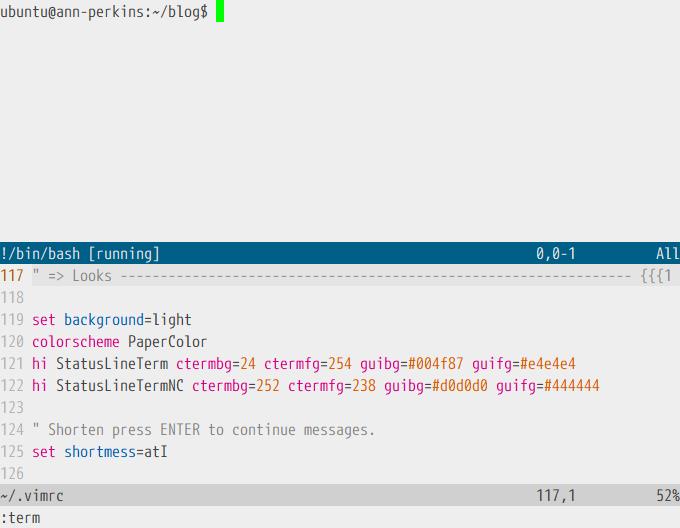 ), you may have noticed that the terminal status bar has no respect for your color scheme. Since terminal mode is still in beta in Vim 8.1, we have to manually set the highlighting groups. It’ll require a bit of digging. 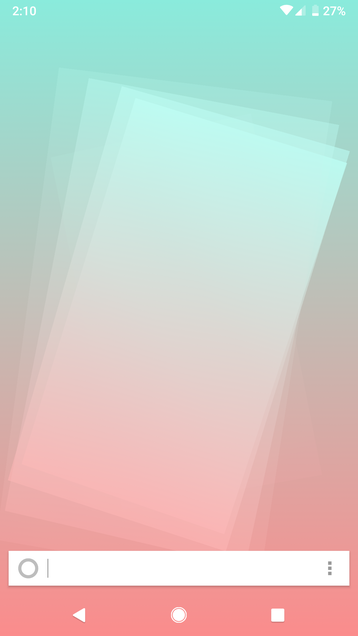 Navigate to the directory containing your current color scheme. Depending on the plugin manager, the color schemes are located in different places. On Linux, default color schemes often live in /usr/share/vim/vimcurrent/colors. In this example, I’m using PaperColor scheme, and I have it installed using vim-plug in ~/.vim/plugged/papercolor-theme, and colors/PaperColor.vim is the file we’re looking for. Search for StatusLine and StatusLineNC (tip: you can do a whole word search in Vim by running /\<StatusLine\>), and note the values used (you might have to jump through a few variables if the color scheme author decided to be fancy). You’re interested in ctermbg, ctermfg, guibg, and guifg.
" Manually set the status line color. Above, hi is a shorthand for highlight, which is used to define highlight group colors. StatusLineTerm and StatusLineTermNC define the highlight groups for terminal mode status line (in active and inactive windows respectively). Options ctermbg and guibg define the background color, and ctermfg and guifg are responsible for the foreground (text) color. Over the past six to nine months I’ve been working on a book - Mastering Vim. 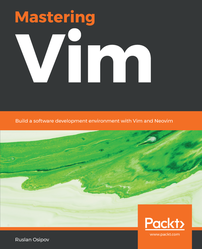 Mastering Vim is a passion project which is meant to take the reader (you) from zero to a hero (future you): from knowing nothing about Vim, to becoming a power user. I cover many of Vim’s mysterious commands, philosophy behind the beloved editor, configuration tips, a plethora of community created plugins, as well as creating your own plugins. Mastering Vim was written with support from Packt Publishing and was kindly reviewed by Bram Moolenaar (website) - the creator of Vim. Many people made this book possible, including VimConf Japan crew, who kindly hosted me earlier this year. Thank you to everyone for making Mastering Vim happen! Give it a read and let me know what you think, Mastering Vim is available on Amazon! P.S: This post, like many others, is written in Vim. For the past few years I’ve been trying to focus on having more mindful experiences in my life. I find it rewarding to be present in the moment, without my thoughts rushing onto whatever awaits me next. I present to you the biggest distraction: my phone. I use to get in touch with people I love. I’m more productive at work because I have access to information on the go. I also use my phone to browse Reddit, YouTube, and every other media outlet imaginable. Even worse, sometimes I just waste time tinkering with the settings or mindlessly browsing through the apps I have installed. Nearly a year ago as I was browsing the Google Play Store I bumped into a new launcher: KISS. The tag line caught my attention: “Keep It Simple, Stupid”. I went ahead and downloaded the launcher. I haven’t changed to another launcher since. There’s nothing besides a single search bar. 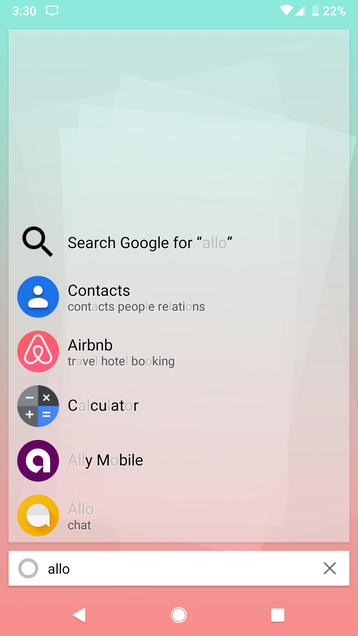 The search bar takes me to the apps I need, web searches I’m interested in, or people I’m trying to reach out to. This simple concept has been responsible for cutting hours upon hours from my phone usage. Opening an app becomes a more deliberate experience, I open my phone with a purpose (granted this purpose might be to kill hours looking at cat videos). There’s no more scrolling through everything I have installed just to find something to stimulate my attention for a few more seconds. You can download the KISS Launcher for Android from Google Play Store.